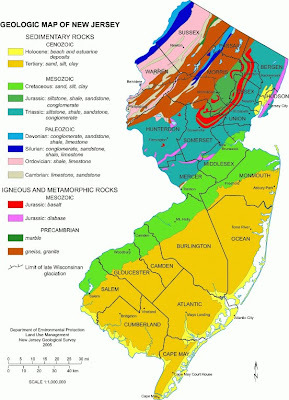 New Jersey has a rich and varied geologic history with rocks from nearly all of the major Epochs of geologic time. This site attempts to summarize the fossil record from each of these epochs by providing a systematic breakdown of the fossils found during that time. The site also contains many links to other sites related to New Jersey fossils as well as a summary of scientific papers and books related to New Jersey paleontology and the related geology. Please feel free to contact me with comments and suggestions related to this site. Although it does not have a state fossil, New Jersey does have a state dinosaur. The drawings above are from the description of this dinosaur, published in 1859. This herbivorous, duck-billed dinosaur lived in the forests and swamps that bordered the eastern shores of North America during the Cretaceous. The site where the Hadrosaurus was discovered was dedicated a National Historic Landmark in 1995. Another article on the Hadrosaur.